Vegin' Out VS South Beach Diet | Which Company Is The Best For You? Due to the perishable nature of our products, returns and refunds cannot be processed once an order is being processed in the warehouse or already shipped. Vegin' Out VS South Beach Diet | Which Company Is The Best For You? Compare our professional reviews for them. In order to help you to find which plans, services, or products may represent the better choice for you, we have compared Vegin' Out with South Beach Diet, based on few major characteristics of the products and services: Popularity, How it Works, Different, Health & Nutrition, Meals, Menus and Recipes, Plans & Pricing, Help & Support and more. 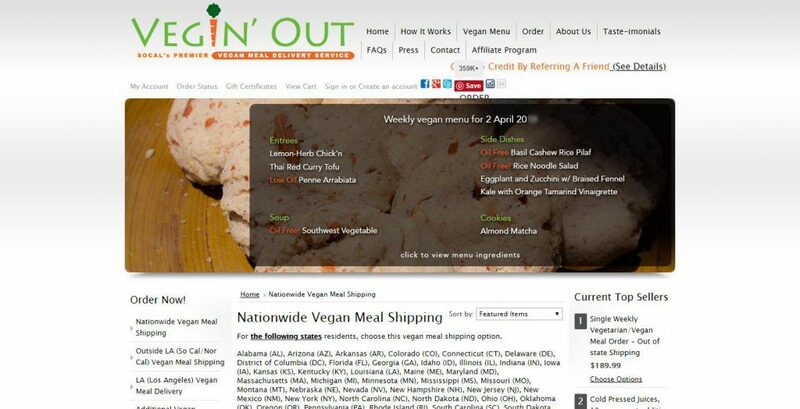 Vegin' Out, founded in 2000 by brothers Chef Tim Boissy and Dan Boissy, is a meal delivery service catering to all vegans and vegetarians. This California-based company is now owned by Shad Loh. The company operates in Los Angeles combining an office space and commercial kitchen into one with the vision of providing the California Regions- Northern and southern- and the rest of the United States with nothing but the freshest and healthiest cuisines for vegans out there. The company caters to almost every need of their customers, aside from its dedication to choose the premium ingredients and provide innovative meal ideas regularly. All ingredients and meals can be customized upon request while maintaining a unique approach on finding and providing customers with additional items from entrees, cookies, salad dressings, and side dishes needed due to individual tastes and preferences. Keep reading our honest Vegin' Out review to learn more. No matter which angle you look, Vegin’ Out seems to be the best in what they do out of all vegetarian and vegan meal delivery services. Aside from the fact that they use all organic ingredients whenever possible, you will have them delivered fresh all the time. They look out after your health and safety by not simply leaving your package by your doorstep but rather pack them insulated and ensure that someone will get it for you for proper food keeping and storage. You can always make a special request to modify your dish based on ingredients use or remove a dish and replace with any of the dishes in your meal package. And if you cannot wait for your meals to come, you may also request to expedite your meals’ delivery upon ordering with an additional fee. Healthy and tasty, great portioning, and meal package options, you can have them all at a very competitive price. Having a pre-prepared meal every week alleviates the burden of going to the supermarket for ingredients and prep them up. Vegin’ Out is your perfect partner for heaving quick, easy, and healthy vegan meals prepared by chefs to protect your health. If you care so much about your health and weight, the South Beach weight loss program is the one for you. Its focus is on helping you develop sustainable eating habits and improving our heart health. By following this diet, you can transform your metabolism to become a fat burning machine in healthy, sustainable lifestyle. This structured exercise program leaves many reasons for customers to try it for weight loss.